What a bizarre story. I will go along with the claim the animal did not target the kid. It was just frustrated. I am glad it won't be euthanized. He who is without guilt...pick up the first stone and toss it... Oh crappers, we have one guilty elephant now. Now, under Sharia Law, we must be able to stone that elephant to death. I say they build a big trebuchet and fling old pianos at it. 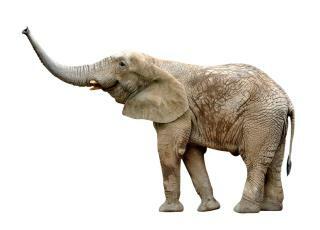 The elephant says to itself, "Self, what the F."
anybody clock the speed of that rock? could be the first elephant in the MLB.